The Alternative Trade Mandate has been developed in extensive civil society consultations all over Europe. 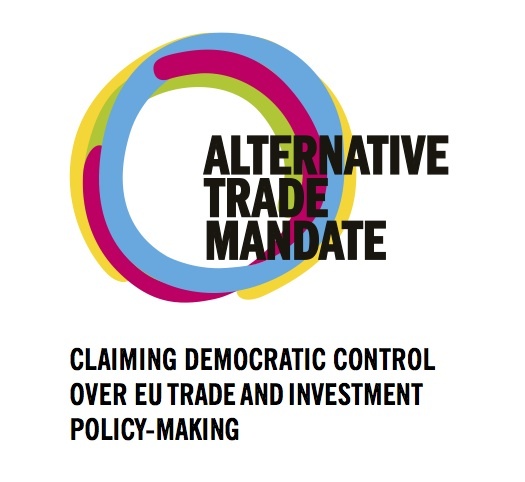 The members and supporters of the Alternative Trade Mandate Alliance do not necessarily agree with each and every detail in this paper, but support the general line of thinking. We also consider it a living document and an invitation for others to join the debate on the future of EU trade and investment policy. The Alternative Trade Mandate Alliance is an alliance of development and farmers’ groups, Fair Trade activists, trade unionists, migrant workers, environmentalists, women’s, human rights, faith and consumer groups from all over Europe, developing an alternative vision of European trade policy that puts people and planet before big business. human rights, women’s rights, labour rights, indigenous rights, and the protection of our environment to take priority over corporate and private interests. structural transformation, universal access to quality public services, social protection, higher labour and environmental standards, democracy and transparency. governments to regulate imports, exports and investments in pursuit of their own strategies for sustainable development. countries, regions and communities to regulate the production, distribution and consumption of their own goods and services. European trade policy to respect the right of countries and regions to develop – and give priority to – local and regional over global trade (for example, in the food sector). European governments and parliaments to hold their corporations to account for the social and environmental consequences of their operations in Europe and elsewhere. food sovereignty to be respected, allowing countries and communities to prioritise local and regional food systems. an industrial policy to be promoted, to favour a just transition towards a different development model. binding social and environmental regulations to be strengthened, and full transparency in global value chains. a fair distribution of income within global value chains, guaranteeing a stable and decent income for producers and workers, and affordable prices for consumers, particularly for necessities such as food and medicines. governments, parliaments and public authorities to have full rights to regulate financial markets and the financial services sector, in order to protect social rights and welfare, secure sustainability, safeguard democratic control, and ensure financial stability (including restricting capital flows). the exchange of, and free access to, knowledge – e.g. through open source systems, seed exchange initiatives or patent pools, and open licensing to promote innovation and access to medicines. for certain sectors, such as public goods such as water, health and education, or financial services, to be excluded from European trade and investment negotiations. common but differentiated responsibilities to be recognised for developing countries, and special and differential treatment to be ensured for the poorest ones. the precautionary principle (where responsibility is taken to protect the public from suspected, if not proven, harm), to be applied in all regulation and trade and investment rules.